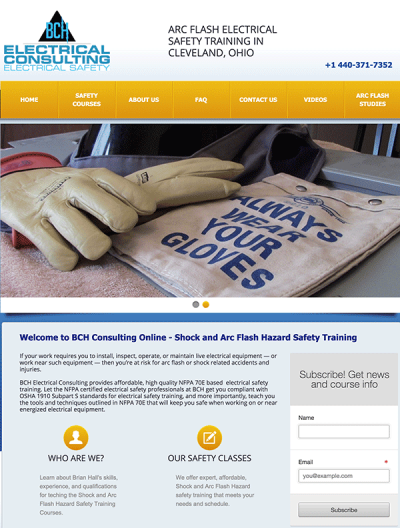 Brian Hall, president of BCH Electrical Safety Consulting, found me via a seminar that I gave on online marketing and lead generation at Lakeland Community College in Mentor, Ohio. 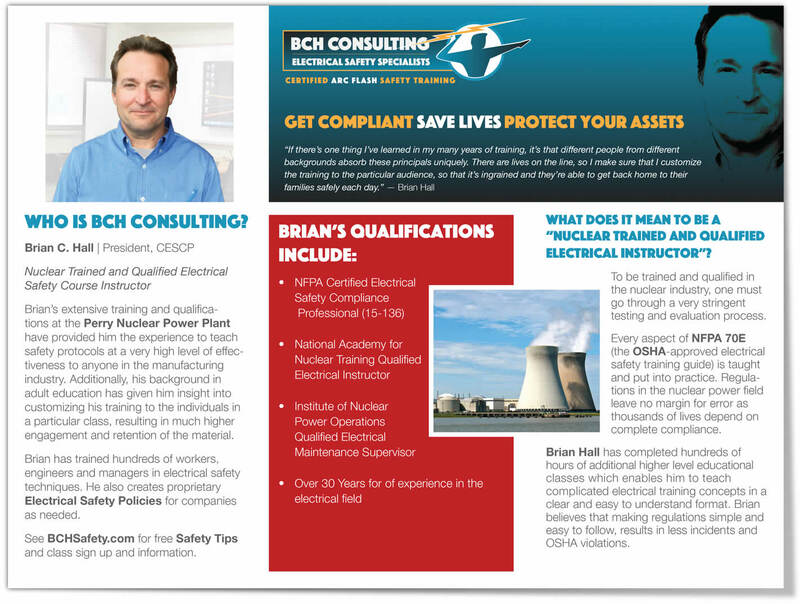 Brian is a certified electrician and safety instructor who had built his own safety training business on the side while still working at the Perry Nuclear Power Plant. He had a few jobs under his belt, but knew that he needed to catapult forward. He created his first website and logo himself, but he knew that it was time to upgrade. He was looking for the full package: Re-branding, website, SEO, social media, content marketing plan/lead generation. Brian started out lean and smart, piecing things together as he was still working within his profession. He was understandably trepidatious about signing a 9-month contract for a complete marketing implementation. ROAD MAPPING: I proposed to Brian that he first commissioned me to do a complete RoadMap for him. This is (in this case) a three phase fully fleshed out marketing plan that is centered around mitigating risk and providing enough detail that should he want to find a third party to implement it, or to simply quote against my own proposal, he could easily do just that. Brian loved the idea as it took the mystery out of the online marketing effort and broke it down into digestible phases in which I have to prove Return On Investment (ROI) at each Phase before moving forward – so little investment is at risk. Phase 1: Branding: This was huge. Included a redesign of the logo, website, business cards, SEO, social media, initial sales funnel/email campaign, trade show display, training manual, flyers and brochures. Phase 2: Business foundation and Advertising. We put a lot of things in play in Phase 1 – including a lot of leads and clients. We need to organize our on-boarding/off-boarding processes, nurture our leads and manage our many projects. This Phase will be more than paid for with our Ad Campaign – expound on content marketing plan. Run Google AdWords, Facebook ads. Phase 3: Online training materials. Supplementing traditional training with online packages. I’d imagine that most people would simply start with the logo, then move onto the business cards, then to the website. I started all three at the same time. I like to get the information that I have into my website framework and start pushing content and colors around and see how their interacting. After a bit of that, I go back to logo roughs – first in pencil, then on the computer. I never show a client a proof that is less than print-ready, otherwise they fall into the role of Art Director and that’s never a good thing. Nope. Instead I leave that to my Facebook friends! I always put out my proofs onto Facebook to have friends rank their favorites before I even show my client. After tweaking my proofs as according to the feedback, I then present the final proofs (usually 3-4 at this point) to my client… letting them know that I already have market study data, but won’t share until after they’ve come to their own unadulterated opinion. The final logo won by a landslide, both on Facebook and with Brian Hall. I added it to the header of the website to give me another element to help shape the vision, and I went to work on the the business card. Your business card should be your marketing elements stripped down to only the essential elements – logo, main imagery, colors, slogan and NAP (Name, Address, Phone) information. If you ever met Brian Hall, or even saw him on one of his videos, you’d know immediately why I insisted on him being in the forefront of the branding. But, it’s not just that he’s obviously a salt-of-the-earth guy, it’s that I want to play up his expertise. This is the core of the entire 3 Phase marketing campaign. He’s NUCLEAR QUALIFIED – a distinction that I haven’t seen in another trainer. He’s also trained in Adult Education, and applies these skills to his customized training. We hope to put on additional trainers in the future, but they will be well-versed in the Brian Hall brand. 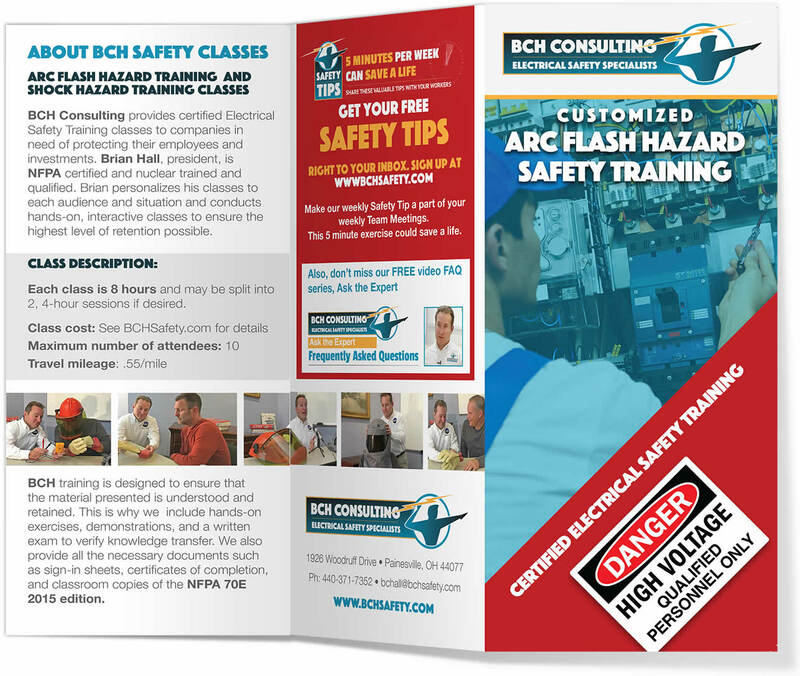 We also intend to customize his training manual and create our own premium book further establishing Brian Hall as the industry leading expert. It drives home the point, is dynamic and has maximum impact, so it passes the EdwardsCom test. And the final imagery will carry us through our other marketing materials. Our content implementation is closely tied into our SEO and email campaign (Safety Tips, above). We needed to establish relationships with people in the industry with Brian. And Brian, who is as busy as anyone I know, needed a content marketing plan that is sustainable for his busy schedule, so I knew we had to repurpose what he has on hand as much as possible — thus Safety Tips was born. A very useable free safety tip brought to the prospect’s email box. We take these straight from Brian’s Training Manual and add pertinent stories and factual links. The actual top of our sales funnel are the free FAQ videos on the homepage. Which then lead to the Case Studies, which, in turn, leads to Safety Tips. 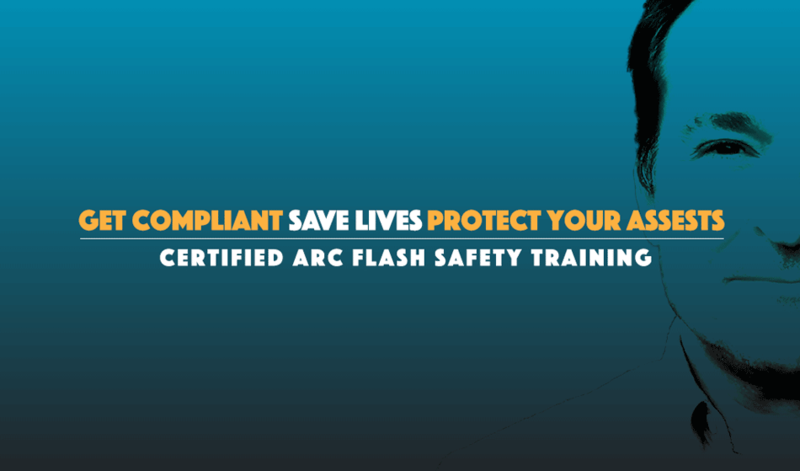 Our intention is to create and provide premium online training in our Phase 3 based upon feedback from our Safety Tips friends. We established and enhanced our Google Plus, Google My Business, Facebook Fan Page and LinkedIn presence, as well as our implemented main online directories to shore up our Local SEO. Of course, I optimized all of the website as well. 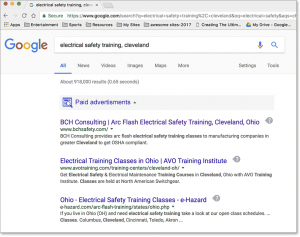 We are currently #1 for “electrical safety training, cleveland” Google searches and #3 for “arc flash safety training, cleveland”. <UPDATE: July 1, 2017– we are now #1 for this as well!> And I expect to improve on the latter within a few months as we implement more content. 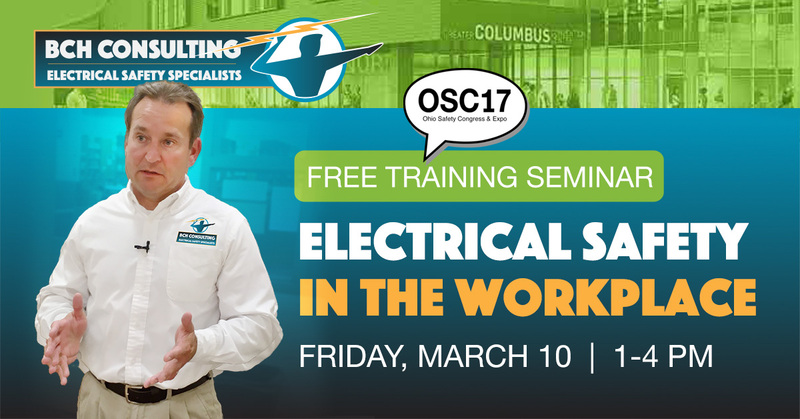 Our social media content consists of the Safety Tips, Case Studies and I transcribed Brian’s 3-hour Safety Training Presentation at OSC17 in Columbus. Again, we’ve needed to make the most of Brian’s existing materials as his time is at a premium. Image is everything at a trade show with your peers. It’s important to have a solid brand and that it’s consistent throughout your marketing materials. 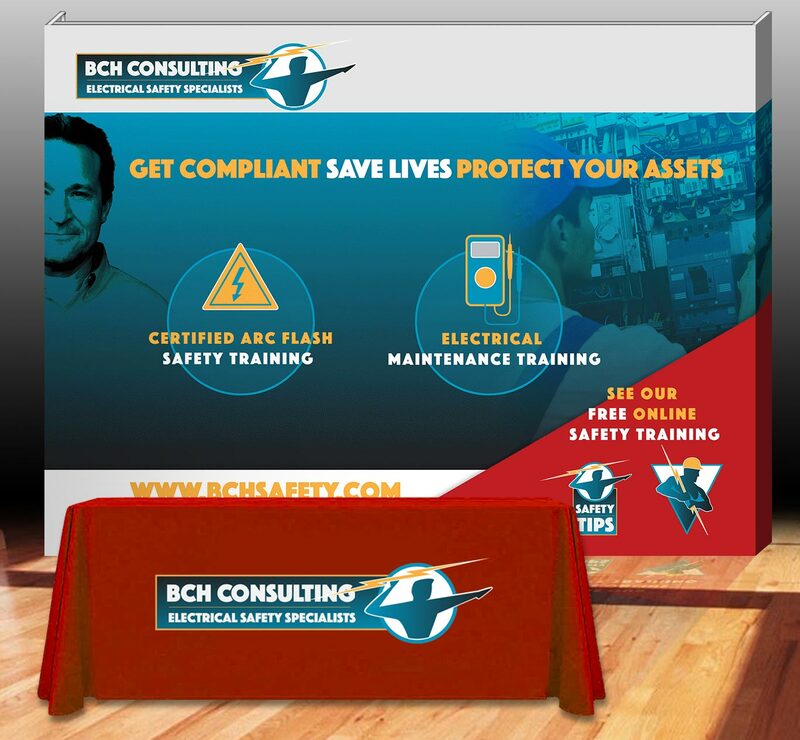 I created this cost-effective, reusable trade show display with the production assistance of longtime friend and colleague, Valerie Hurst of Skyline displays in Columbus. The show was OSC17 in Columbus and it was a huge success by every measure. Brian’s brand really shined at the event. We got 70 leads from booth traffic alone. 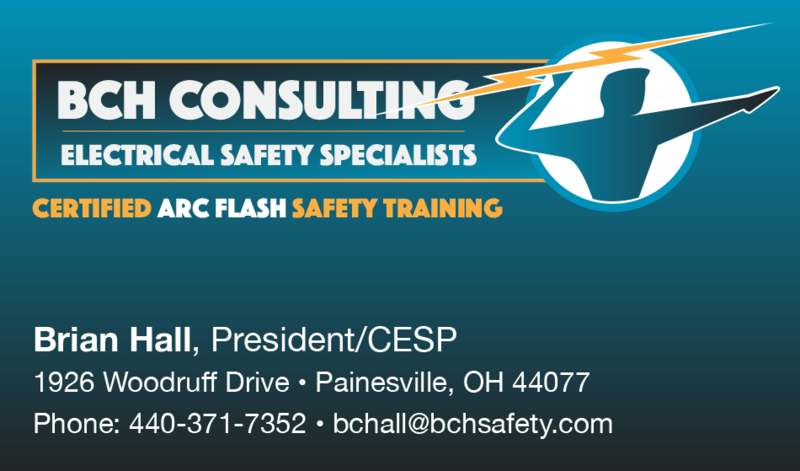 Brian closed the show with his 3-hour presentation on electrical safety. I recorded audio for it and had it transcribed to feed our content marketing (along with photos). I had an excellent presence at the event. Tons of comments! And we got a lot of very solid leads. I can’t tell you how grateful I am for Barry’s assistance! Want to see even bigger ROI? Check out our ad campaign! If you’d like to discuss how proper branding and marketing can dramatically increase your business, fill out the form below. Do you have an established brand (logo, business cards, colors, signage...) that you are happy with? If so, can you supply vector (or high resolution) files if we're to move forward? If not, please elaborate. Please tell me about your website needs. Is it to be e-commerce/lead generation/membership? About how many pages? Do you have appropriate social media channels. Please briefly tell me which ones, and how you use them in conjunction with your website. If so, what are you looking to improve upon? Typically for RFPs, logos or mockups.